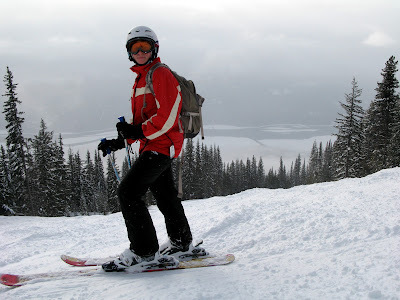 As I mentioned earlier, I learned to ski at the ripe old age of 23 in Alaska with my partner in crime as a teacher. Almost three years later, I'm definitely not a pro, but can generally make it down any level of groomed terrain without causing irreparable damage to my body or my ego (*knocks on wood*). I've learned and used a number of drills to teach me technique at various points of my short skiing career and still revisit them all at the beginning of each season. I'd like to share some of my favorites, hopefully to the benefit of other beginner and intermediate skiers. What's the point? This drill teaches you how to control the pitch of your edges and perfect your balance. Doing it: I've heard this drill called a number of different things, but I like to think of it as doing my part to keep the snow completely flat, packed, and looking perfectly undisturbed. When you do this drill correctly, you leave a perfectly flat, groomed swath of snow behind. This drill won't work well on powder, but is perfect for groomed east coast slopes. Stand with your skis perpendicular to the slope, and slowly roll over on to your edge. See if you can hit the edge just perfectly to slide down the hill slowly, sideways, leaving a completely flat patch of white in your path. What's the point? You'll learn to keep your upper body quiet and initiate the turning motion with your lower body. This drill is super helpful for skiers who tend to swing their upper body to turn; I had a huge problem with this initially, and still do! Doing it: Take your ski poles in both hands and grip them shoulder with apart, palms facing either up or down, and hold them at shoulder height horizontally (parallel to the ground) in front of you. The poles are your "tray." Execute S-turns while keeping the "tray" as level and undisturbed as possible. Ziggyskier.com advises skiers to pretend they're snooty servants providing afternoon tea - no spilling! What's the point? By learning to keep your chest pointed at the base of the slope and making turns from your hips, you'll have a lot more control and be able to execute cleaner turns more quickly. It's the same principle as the tray drill. You want your upper body to float down the hill, no bobbing and weaving, while your legs and hips do all the work. Doing it: Grip the middle of the poles, one in each hand, and extend your arms. Keep the poles perpendicular to the ground, like you would when you're actually skiing, but off the ground. The poles will create a "viewfinder," as if you're pointing a camera at a point to take a photo. Use a specific view at the base of the hill as your focal point and keep it in your viewfinder as you execute turns down the hill. If you move your viewfinder too much, the photo will be blurry, of course. Ziggyskier.com calls this the "Frame" pole exercise. The "picture" in your viewfinder should be an area at the bottom of the run that is on the fall line, i.e. where you would end up if you just skied straight down. What's the point? Get your body to feel what it's like to make perfect turns on both edges with both legs. This is the ultimate edge control drill. You'll be forced to make the turn only on the edge of your ski, because if you let your ski go flat on one foot, you will fall, or end up pointed straight down hill. Beginner skiers tend to keep their skis flat on the snow and slide through turns, which causes them to catch edges and fall quite often. This drill also helps skiers link their turns together more smoothly. Doing it: Ski down the run on both skis and when you begin a turn, lift your inside ski (if you turn left, it is your left ski) off the ground and make the turn only on your outside ski. Once the turn is completed, immediately put your foot down, raise the other, and turn the other way. If you have too much trouble balancing, you can let just the tip of your lifted ski drag on the snow. For a much greater challenge, try lifting the outside ski on each turn instead. What's the point? It forces you to focus on initiating turns by putting pressure on the edges of your skis and shifting your weight. Doing it: Easy... crouch down into a sitting on the toilet position as you ski along and then slowly stand up as you initiate your turn, so you are standing at the apex of the turn. As you begin to come out of the turn, sit back down. You should be constantly moving up or down, not remaining in the standing or sitting positions for more than a second or two. This is also a great leg burner if you're not getting enough of a workout in during your day on the slopes! Do you have any other drills you've learned over the years that have made you a better, more efficient skier? Post your favorites in the comments section!